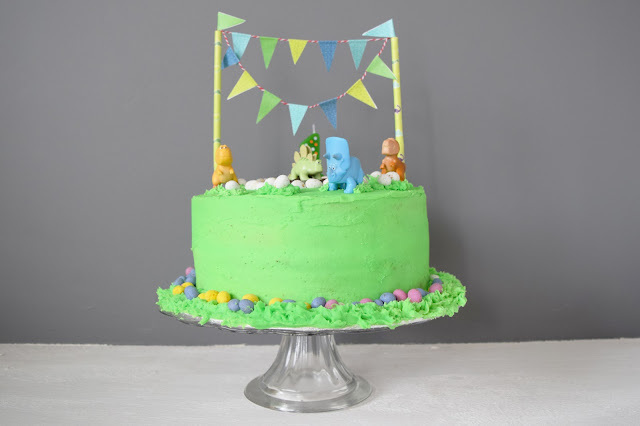 I recently shared a post on Ethan's First Birthday and a picture of the cake but I didn't go in to too much detail on it. 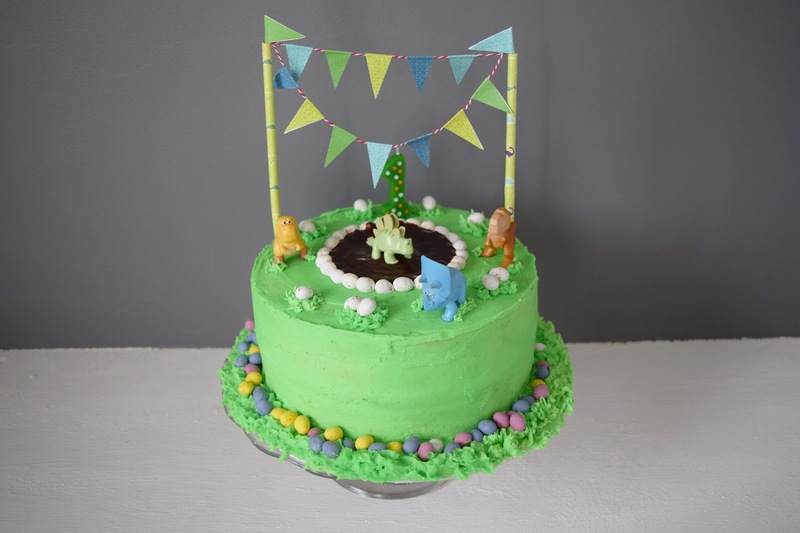 After some thought I realised I always share the recipes of the cakes I make so why not this one too? I used my go to chocolate cake recipe (is there any other to use?? 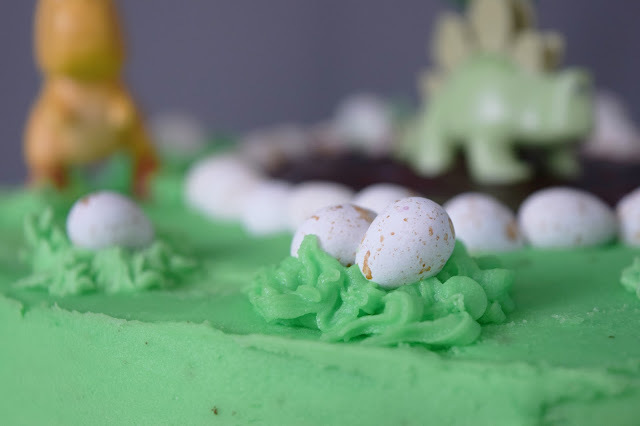 ), filled it with chocolate ganache and iced it with green coloured vanilla buttercream. I remember decorating the cake in the kitchen and Tom walked in and I started to cry. My parents and brothers were in the living room and I didn't want them to know I was upset so through silent tears I told Tom I couldn't believe our baby was almost one and I was making his first cake (of many I hope). I found myself reflecting on the past year and remembering how I felt at that point last year when labour had just started. I let myself have a moment then quickly pulled myself together and go on with the decorating the cake. I did have to modify it slightly as I couldn't find the grass nozzle which I think got lost moving house but thankfully I was able to use one of my more obscure nozzles that still gave a bit of a grass effect. Not exactly what I was after but better than nothing. A dollop of ganache and some Sainsburys micro eggs gave the illusion of dinosaur eggs. 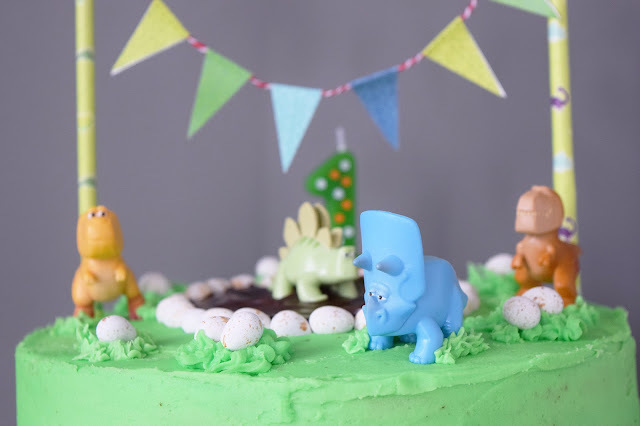 I also bought the dino figures off eBay as there was no way I had the time to sit and model a load of sugar dinosaurs. Thankfully the little man loved it and I managed to stretch it to feed over 20 people woop! 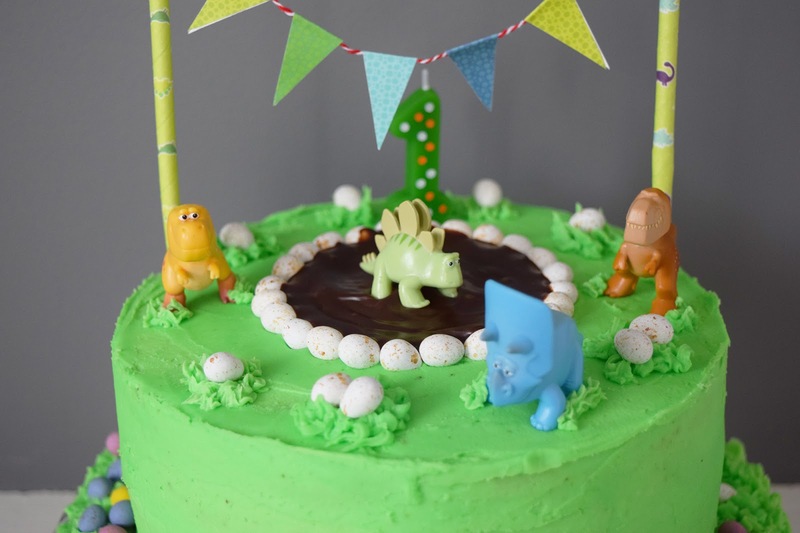 Scatter the remaining eggs over the cake, pipe on some grass and decorate with dinosaur figures.